It didn’t take long for far-right conservatives to come up with a radical conspiracy theory surrounding the incident that happened at the U.S. border last week. 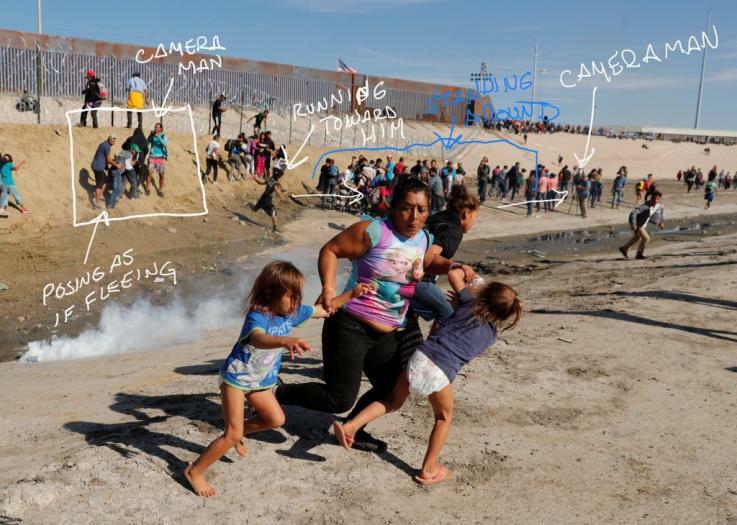 Even though dozens of photos and videos were released showing migrants suffering from the effects of tear gas, Trump’s fan club picked apart a single picture and labeled the whole occurrence fake news. Their proof? A photo with a bunch of circles and words written on it. The far-right is desperate to prove that the migrant photos are fake, and the results are hilarious! One of the pieces of evidence presented by the far-right that’s supposed to prove these images were staged is that there are cameramen all over. Don’t forget that this was supposed to be a peaceful march that 500 migrants from the large caravan participated in. It attracted a ton of media, who were all present when several marchers attempted to hop the border illegally. They captured pictures of the migrants climbing fences, throwing rocks, and the U.S. border agents retaliating by using tear gas. The woman captured in what has now become an iconic photograph is 39-year-old Maria Meza. Single mother of five, Meza told Buzzfeed News that she was standing at the border with her family when the tear gas was thrown. They weren’t trying to cross the border like some of the others but were still targeted by border agents. They were only supposed to march that day, which was likely a nice break from the strenuous hiking they’d been doing the weeks prior to this incident. With five kids walking all those miles, Meza likely decided to take the time they had off from hiking to wash some of their clothes. This is hardly proof that this is a staged picture. The single mother from Honduras also told Buzzfeed News that one of her daughters lost her shoes in the mud while they were running, which would explain the bare feet. The fact that women and children were so close to the front of the border leads conservatives to believe that it’s all fake news. You have to remember though, this was supposed to be a peaceful march. A select few turned it into chaos by trying to cross the border. Many of the migrants even believed that the United States would open the border for them, and certainly didn’t expect border agents to throw tear gas. While there are a ton of photos of migrants suffering from the effects tear gas can have, the incident was confirmed by a ton of reliable news outlets. Additionally, the president and officials at the U.S. border confirmed that tear gas was used to push back migrants who had been climbing the border wall. There’s just no evidence to support their accusations and a ton to maintain the reports that this image is real.